All apartments feature stainless steel appliances, granite like countertops, track lighting, and all master bedrooms have large garden style bathtubs. In addition, our homes come well-appointed with features such as your own private patio or balcony area, ceiling fans, washer/dryer connections, air conditioning, spacious walk-in closets, and spectacular views. 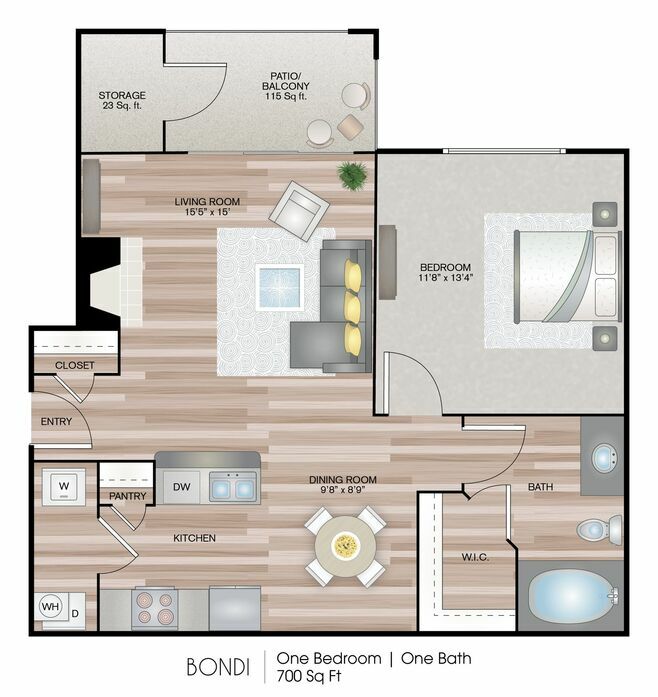 The Bondi one bedroom, one bathroom features a kitchen with stainless steel appliances and hardwood flooring. The bathroom features a spacious walk-in closet and has cozy fenced in yard options. 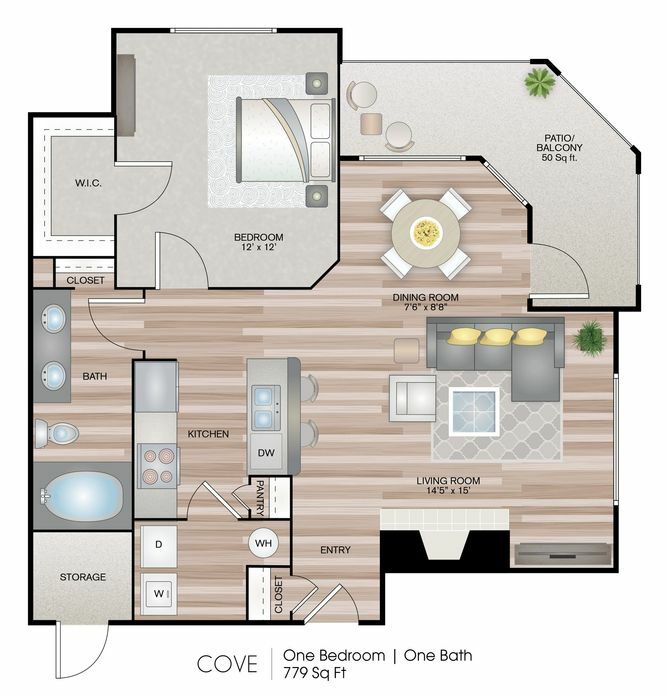 The Cove one bedroom, one bathroom has a huge wrap around patio and exterior storage space. The kitchen features stainless steel appliances and hardwood flooring. The unit bathroom features double Jack and Jill style sinks. This floor plan has a lot of windows in the dining and living area and therefore gets a lot of beautiful natural light. 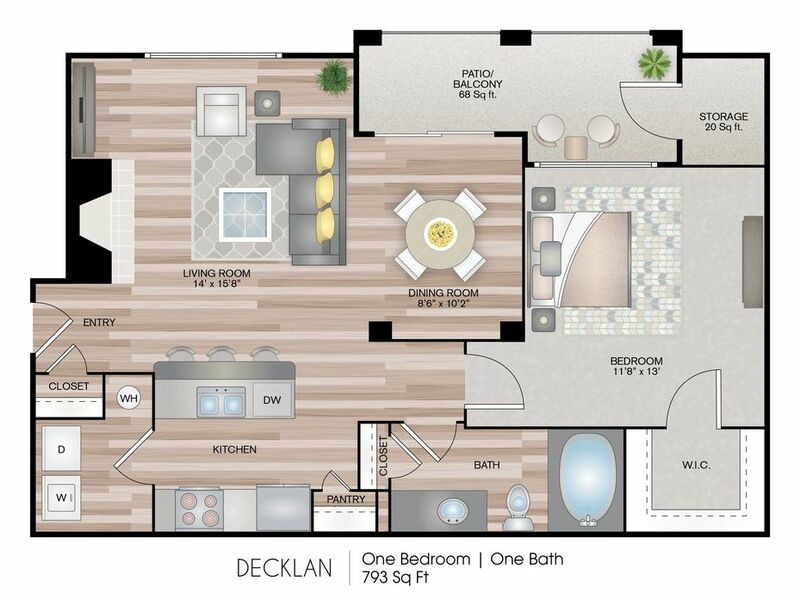 The Decklan one bedroom, one bathroom apartment features a very spacious living and dining area. It has an open kitchen with stainless steel appliances and hardwood flooring, which overlooks the entertainment area. Plus, there is a little nook in the dining area, perfect for an office. The apartment also has a large patio with storage space. 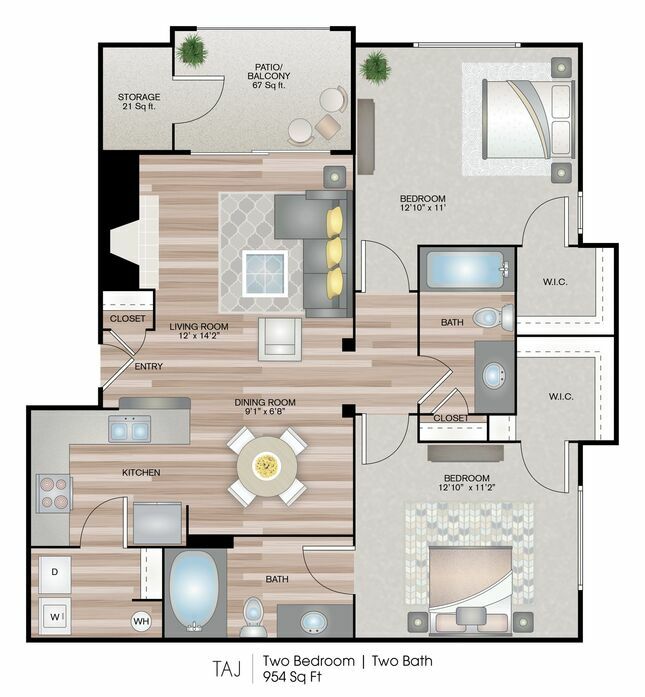 The Deklan with Garage is a one bedroom, one bathroom apartment home. It features a very spacious living and dining area. It has an open kitchen with stainless steel appliances and hardwood flooring, which overlooks the entertainment area. Plus, there is a little nook in the dining area, perfect for an office. The apartment also has a large patio with storage space. 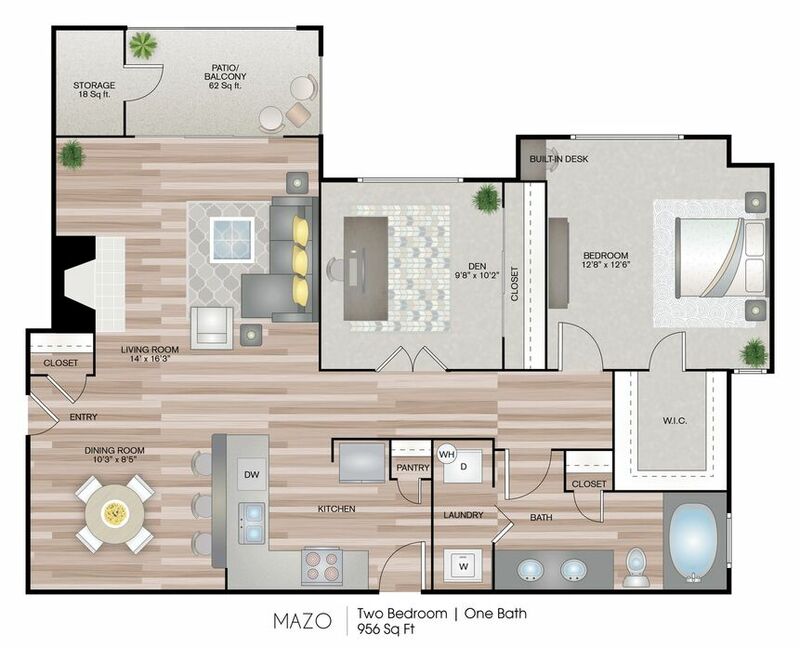 This Mazo one bedroom, one bathroom apartment has a den with sliding mirrored doors and a large closet with a lot of shelving. The kitchen features stainless steel appliances and hardwood flooring. The master bedroom features a mirrored wardrobe closet while the bathroom has double Jack and Jill style sinks. There are also fireplaces on 2nd and 3rd floor units. 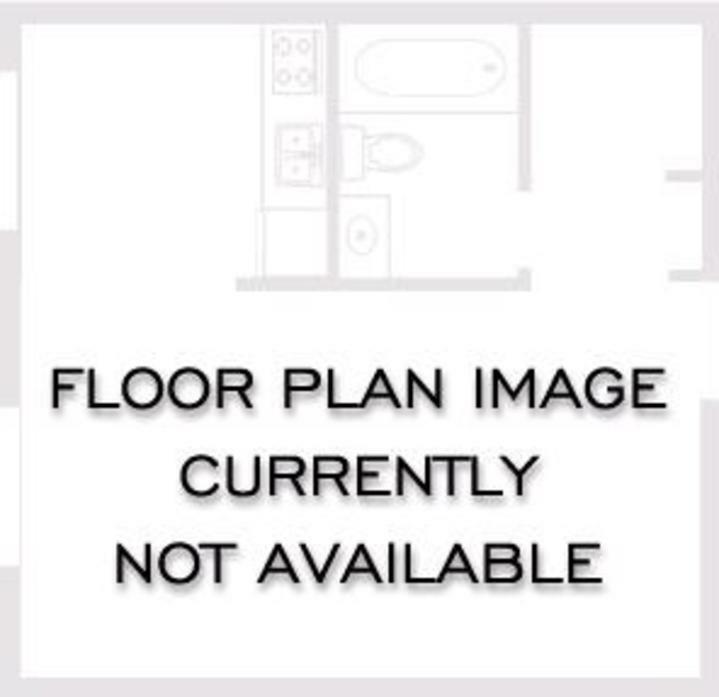 This Mazo with Garage is a one bedroom, one bathroom apartment home. It has a den with sliding mirrored doors and a large closet with a lot of shelving. The kitchen features stainless steel appliances and hardwood flooring. The master bedroom features a mirrored wardrobe closet while the bathroom has double Jack and Jill style sinks. There are also fireplaces on 2nd and 3rd floor units. 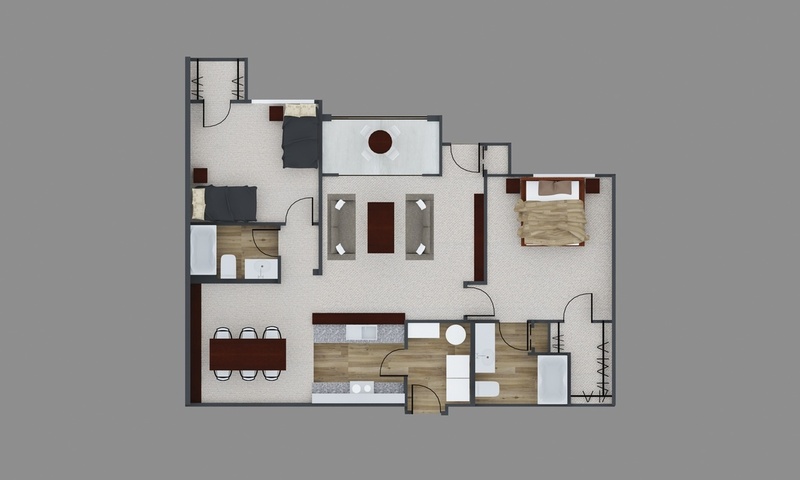 The Taj two bedroom, two bath apartment features a kitchen with stainless steel appliances and hardwood flooring. There are two identical bedrooms each with a bathroom. 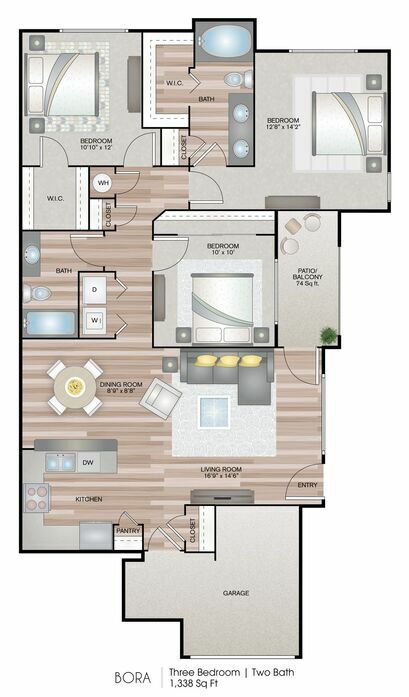 This is a perfect floor plan for roommates, as the bedrooms are on opposite ends of the apartment. There is also a large utility room and storage on the patio. 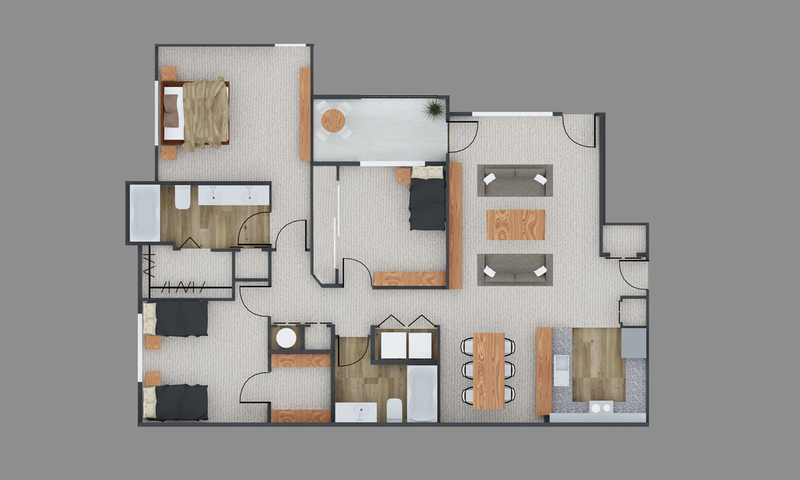 The Oreti spacious two bedroom, two bathroom floor plan comes with a large amount of cabinet space in the kitchen and a built in desk with extra cabinet space right next to the living room. The kitchen features stainless steel appliances and hardwood flooring. There is also a private patio or balcony with exterior storage space. 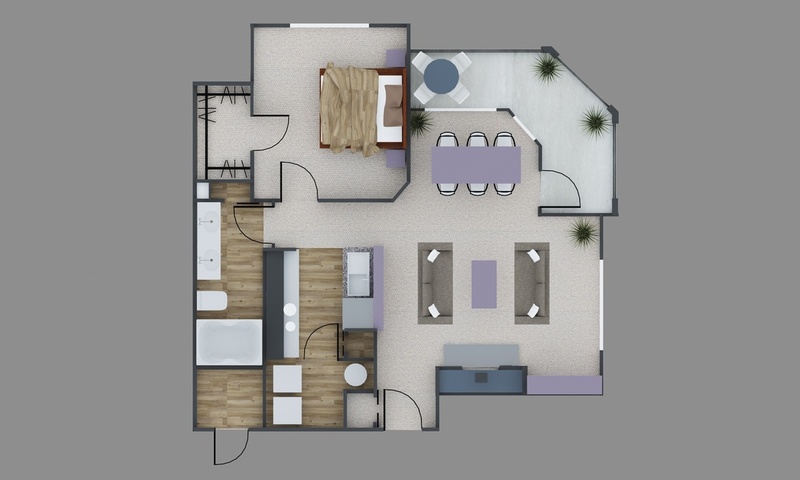 The Nissi two bedroom, two bathroom unit features bedrooms on opposite sides of the apartment for extra privacy. The kitchen features stainless steel appliances and hardwood flooring. There is a large walk-in closet in the master suite. In addition, this apartment features an in-unit washer and dryer. 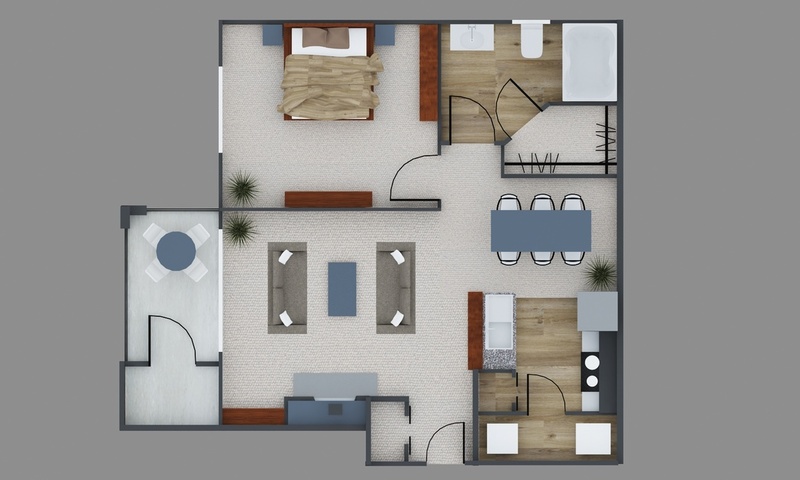 The Xi two bedroom, two bathroom floor plan has an island kitchen that overlooks the entertainment area, as well as a built-in desk in the living room. The kitchen features stainless steel appliances and hardwood flooring. The Master Suite bathroom features double Jack and Jill style sinks. This unit also has fenced-in yard options and exterior storage space. The Taj with garage is a two bedroom, two bath apartment home. It features a kitchen with stainless steel appliances and hardwood flooring. There are two identical bedrooms each with a bathroom. 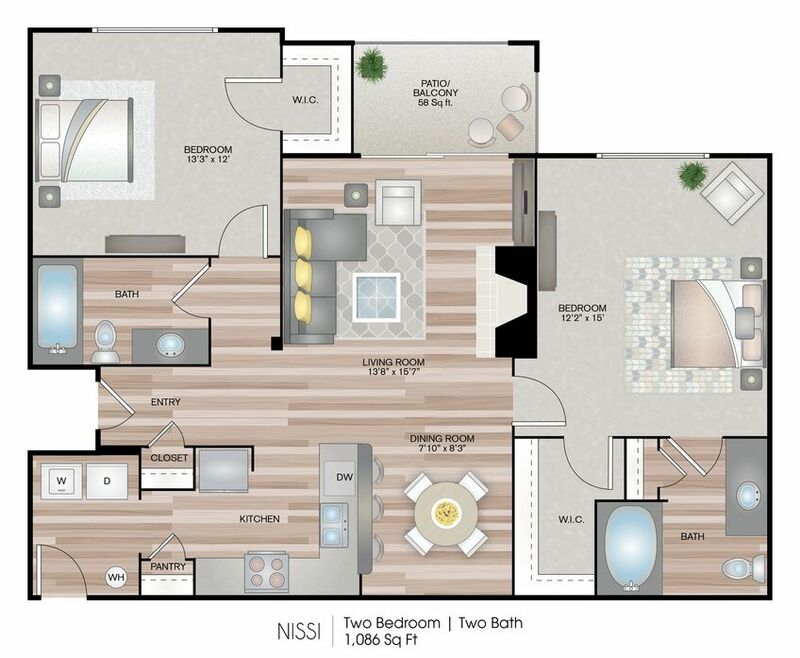 This is a perfect floor plan for roommates, as the bedrooms are on opposite ends of the apartment. There is also a large utility room and storage on the patio. 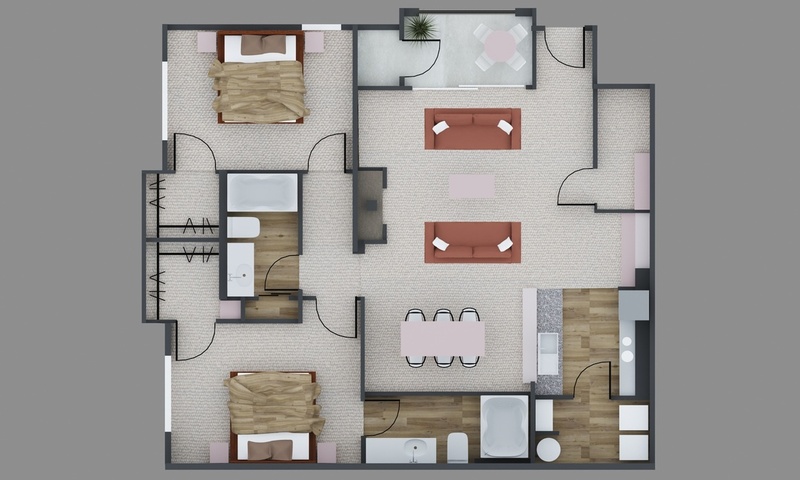 The Nissi with Garage is a two bedroom, two bathroom apartment home. The kitchen features stainless steel appliances and hardwood flooring. The unit features bedrooms on opposite sides of the apartment for extra privacy. There is a large walk-in closet in the master suite. This apartment also features an in-unit washer and dryer. 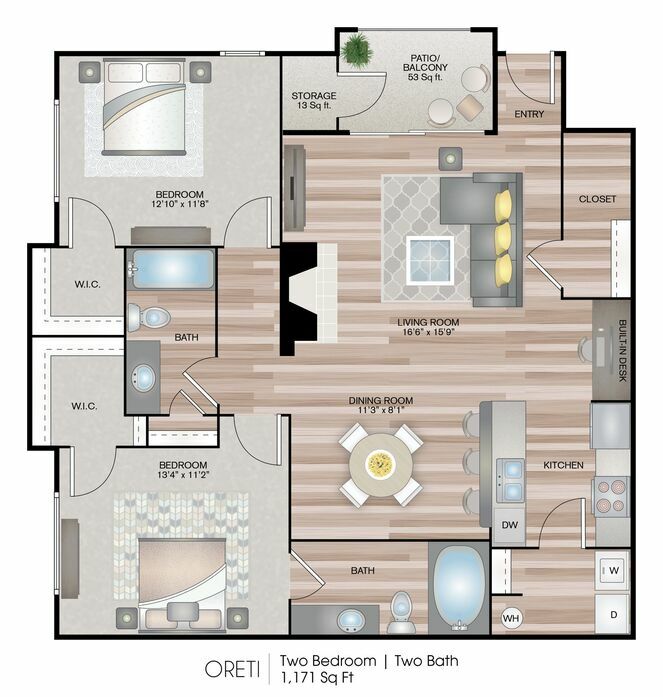 The Oreti with Garage is a spacious two bedroom, two bathroom apartment home. It comes with a large amount of cabinet space in the kitchen and a built-in desk with extra cabinet space right next to the living room. The kitchen features stainless steel appliances and hardwood flooring. 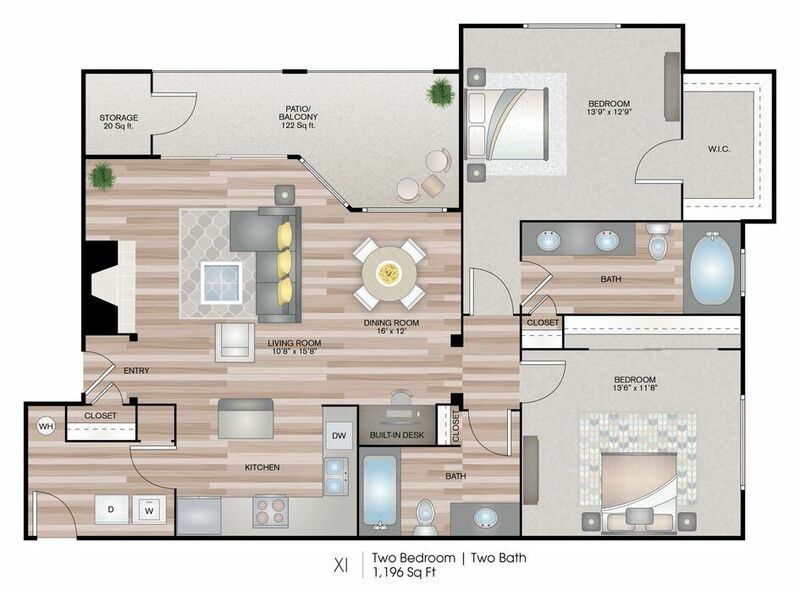 There is also a private patio or balcony with exterior storage space. The Xi with Garage is a two bedroom, two bathroom apartment home. The floor plan has an island kitchen that overlooks the entertainment area, as well as a built-in desk in the living room. The kitchen features stainless steel appliances and hardwood flooring. The Master Suite bathroom features double Jack and Jill style sinks. This unit also has fenced-in yard options and exterior storage space. The Champagne with Garage two bedroom, two bathroom floor plan has a spacious living and dining area with two huge walk-in closets and an attached one car garage. 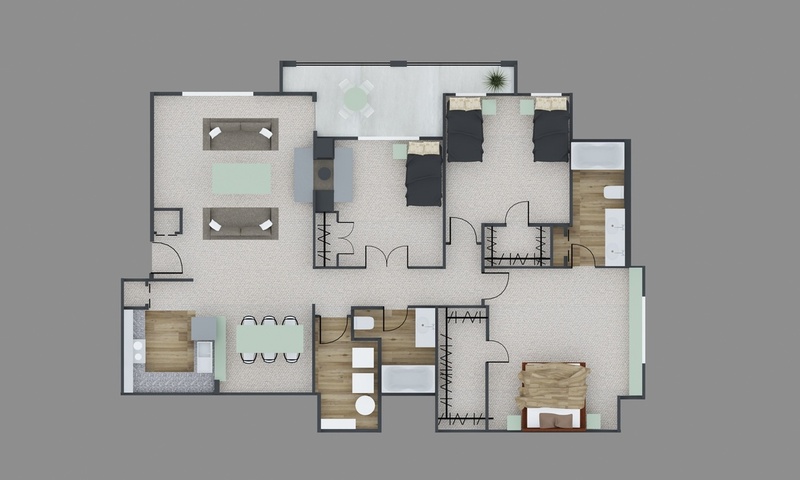 There is an open dining/living area, and bedrooms are on opposite ends of the apartment. The Xi with Two Car Garage is a two bedroom, two bathroom apartment home. The floor plan has an island kitchen that overlooks the entertainment area, as well as a built-in desk in the living room. The kitchen features stainless steel appliances and hardwood flooring. The Master Suite bathroom features double Jack and Jill style sinks. This unit also has fenced-in yard options and exterior storage space. 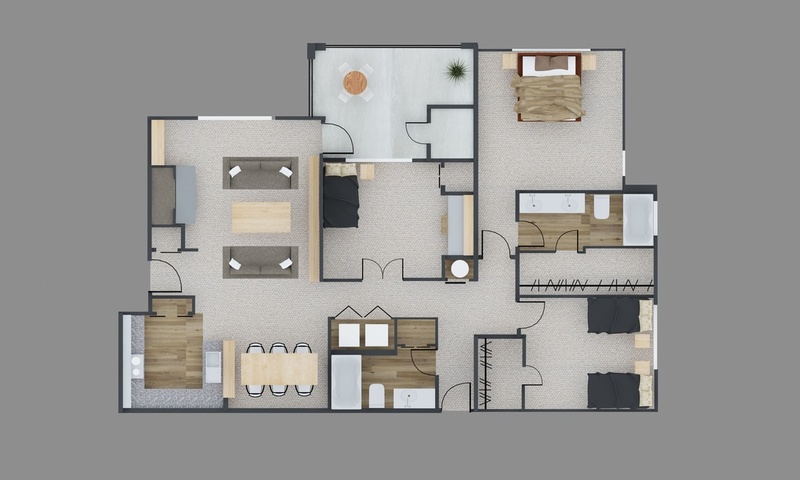 The three bedrooms in this Kiki floor plan are separated by a bathroom, so none of them share any walls. One of the bedrooms overlooks the patio and has huge windows providing tons of natural light. The kitchen features stainless steel appliances and hardwood flooring. The master suite bathroom has double Jack and Jill style sinks. The unit also has fenced in yard options and exterior storage space. 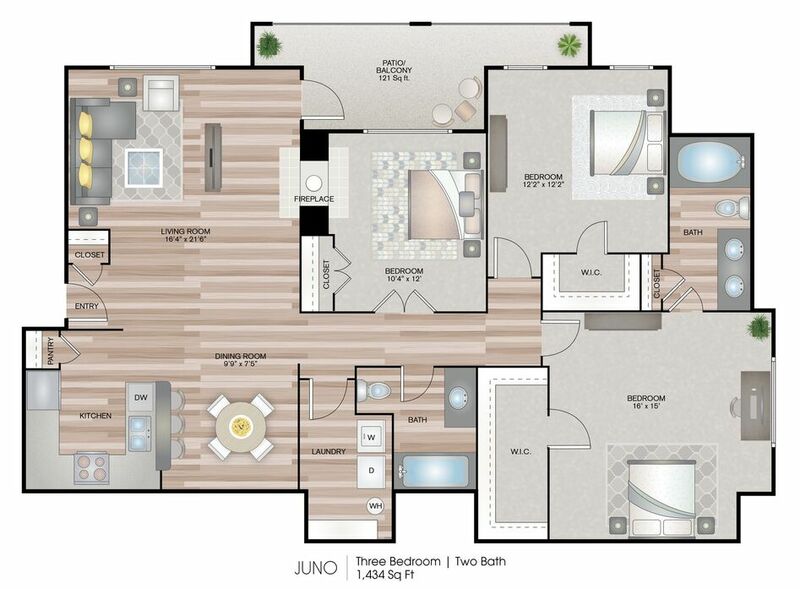 The Juno three bedroom, two bathroom apartment home has substantial living and dining space. It has an option for a wood burning fireplace in the living room on the 2nd and 3rd floors, while the 1st floor offers a fenced in yard. This is the largest three bedroom unit. The kitchen features stainless steel appliances and the master suite bathroom has double Jack and Jill style sinks. 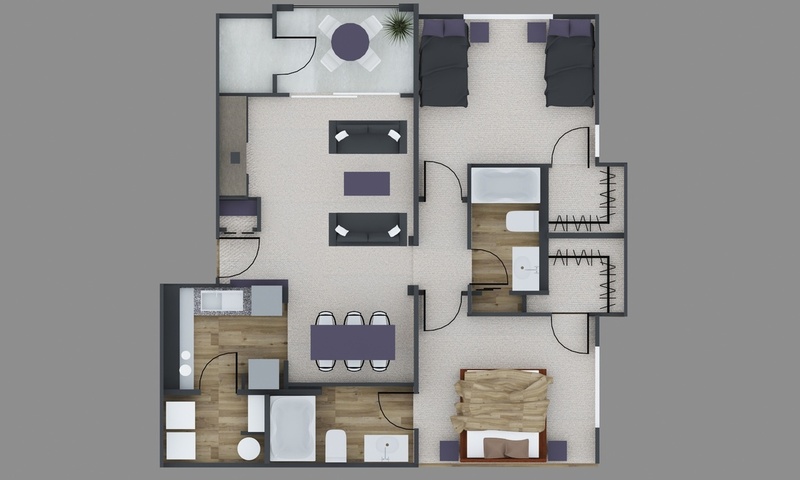 The Bora with Garage three bedroom, two bathroom unit has a spacious, open living area. The kitchen features stainless steel appliances and hardwood flooring. There is a lot of closet space in each bedroom and has a private patio or deck. The master suite bathroom has double Jack and Jill style sinks. The Kiki with Garage is a three bedroom, two bathroom apartment home. 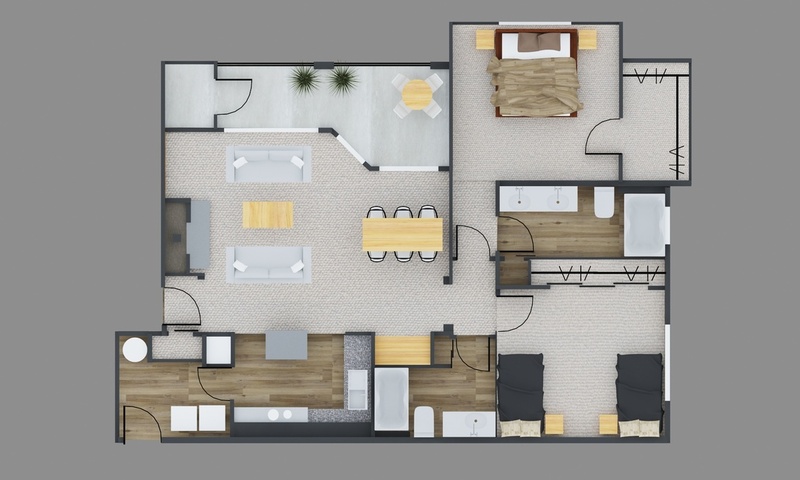 The three bedrooms in this floor plan are separated by a bathroom, so none of them share any walls. One of the bedrooms overlooks the patio and has huge windows providing tons of natural light. The kitchen features stainless steel appliances and hardwood flooring. The master suite bathroom has double Jack and Jill style sinks. The unit also has fenced in yard options and exterior storage space. The Juno with Garage is a three bedroom, two bathroom apartment home. It has substantial living and dining space. The unit has an option for a wood burning fireplace in the living room on the 2nd and 3rd floors, while the 1st floor offers a fenced in yard. This is the largest three bedroom unit. The kitchen features stainless steel appliances and the master suite bathroom has double Jack and Jill style sinks. 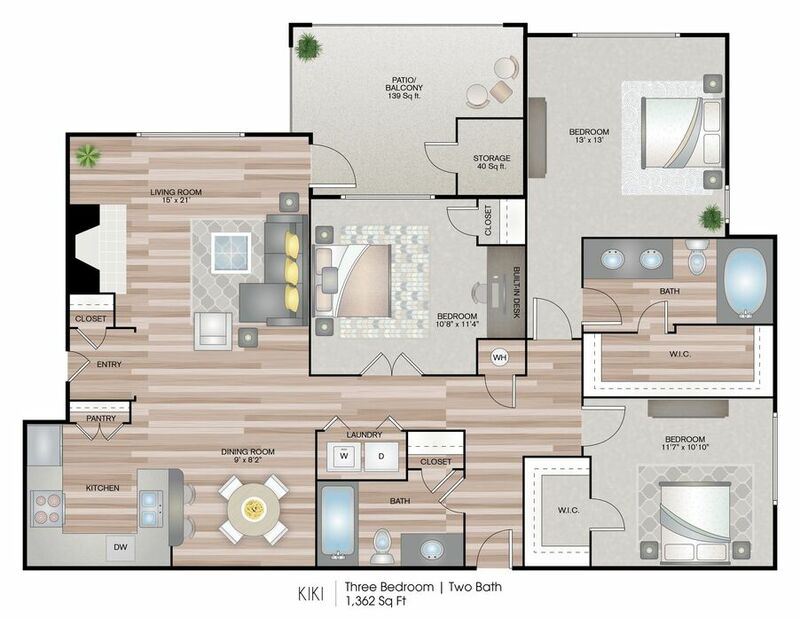 The Kiki with Two Car Garage is a three bedroom, two bathroom apartment home. 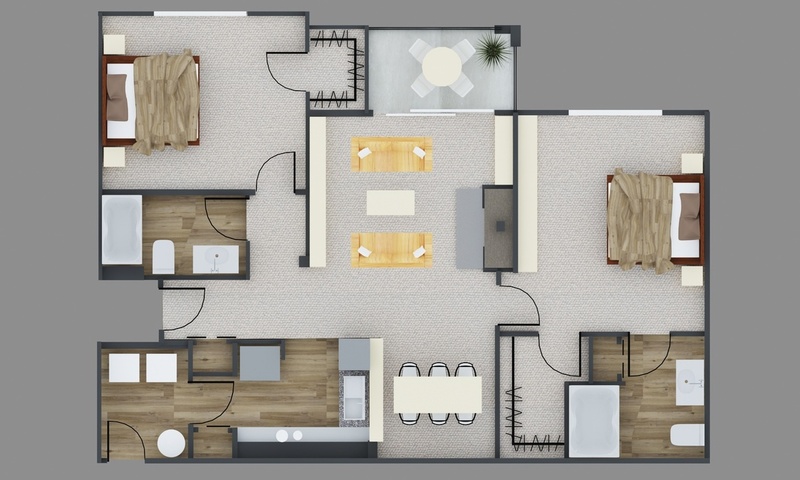 The three bedrooms in this floor plan are separated by a bathroom, so none of them share any walls. One of the bedrooms overlooks the patio and has huge windows providing tons of natural light. The kitchen features stainless steel appliances and hardwood flooring. The master suite bathroom has double Jack and Jill style sinks. The unit also has fenced in yard options and exterior storage space.